Republicanism (not synonymous with the U.S. Republican Party) is the political value system that has dominated American political thought since the American Revolution. It stresses rights and liberties as central values, makes the people as a whole sovereign, rejects aristocracy and inherited political power, expects citizens to be independent and civic minded, and is strongly opposed to corruption. The American version of republicanism was formed by the Founding Fathers in the 18th century and was based on Roman, English, and Renaissance political theory. It formed the basis for the American Revolution, the Declaration of Independence (1776) and the Constitution (1787), and has been echoed in critical statements from Abraham Lincoln, Theodore Roosevelt, Woodrow Wilson, and others. Republicanism is not the same as democracy, for republicanism asserts that people have inalienable rights that cannot be voted away by a majority of voters. The republican ideal of civic duty was succinctly expressed in 1961 by the Democrat John F. Kennedy: "Ask not what your country can do for you, ask what you can do for your country." Americans feared above all the corruption generated by a royal court, with its favoritism, grasping ambition, bribery, patronage, lavish luxury, and disregard of civic virtue. They watched their governments and each other anxiously so that these evils could be squelched immediately should they appear in America—a watchfulness that persists into the 21st century. In a larger sense, the tax issue was part of the representation question, which was increasingly defined by Americans as an issue of republicanism. The commitment of most Americans to republican values caused the American Revolution, for Britain was increasingly seen as corrupt and hostile to republicanism, and a threat to the established liberties that Americans enjoyed. The greatest threat to liberty was increasingly seen as "corruption"—not just in London but at home as well. The colonists associated it with luxury, Royal appointees not answerable to the people, a standing army, unconstitutional taxes, and, ultimately, an system of rule by an inherited aristocracy. For women, "republican motherhood" became an ideal, as exemplified by Abigail Adams and Mercy Otis Warren; the first duty of the republican woman was to instill republican values in her children and to avoid luxury and ostentation. The "Founding Fathers" were strong advocates of republican values, especially Samuel Adams, Patrick Henry, George Washington, Thomas Paine, Benjamin Franklin, John Adams, Thomas Jefferson, James Madison and Alexander Hamilton. "a government by its citizens in mass, acting directly and personally, according to rules established by the majority; and that every other government is more or less republican, in proportion as it has in its composition more or less of this ingredient of the direct action of the citizens.... Governments are more or less republican as they have more or less of the element of popular election and control in their composition; and believing, as I do, that the mass of the citizens is the safest depository of their own rights, and especially, that the evils flowing from the duperies of the people, are less injurious than those from the egoism of their agents, I am a friend to that composition of government which has in it the most of this ingredient." The Founders discoursed endlessly on the meaning of "republicanism." John Adams in 1787 defined it as "a government, in which all men, rich and poor, magistrates and subjects, officers and people, masters and servants, the first citizen and the last, are equally subject to the laws." The open question, as Pocock suggested, of the conflict between personal economic interest (grounded in Lockean liberalism) and classical republicanism, troubled Americans. Jefferson and Madison roundly denounced the Federalists for creating a national bank as tending to corruption and monarchism; Alexander Hamilton staunchly defended his program, arguing that national economic strength was necessary for the protection of liberty. Jefferson never relented but by 1815 Madison switched and announced in favor of a national bank, which he set up in 1816. John Adams often pondered the issue of civic virtue. Writing Mercy Otis Warren in 1776, he agreed with the Greeks and the Romans, that, "Public Virtue cannot exist without private, and public Virtue is the only Foundation of Republics." Adams insisted, "There must be a positive Passion for the public good, the public Interest, Honour, Power, and Glory, established in the Minds of the People, or there can be no Republican Government, nor any real Liberty. And this public Passion must be Superior to all private Passions. Men must be ready, they must pride themselves, and be happy to sacrifice their private Pleasures, Passions, and Interests, nay their private Friendships and dearest connections, when they Stand in Competition with the Rights of society." Adams worried that a businessman might have financial interests that conflicted with republican duty; indeed, he was especially suspicious of banks. He decided that history taught that "the Spirit of Commerce . . . is incompatible with that purity of Heart, and Greatness of soul which is necessary for an happy Republic." But so much of that spirit of commerce had infected America. In New England, Adams noted, "even the Farmers and Tradesmen are addicted to Commerce." As a result, there was "a great Danger that a Republican Government would be very factious and turbulent there." Jefferson and Andrew Jackson likewise were embattled enemies of national banks, which they feared were fronts of corruption. 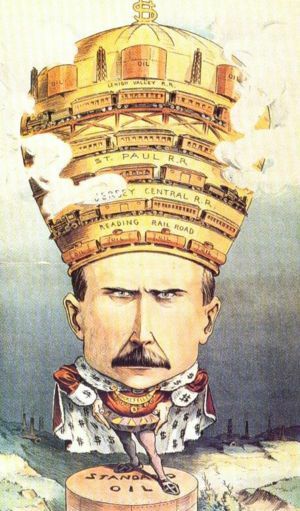 The theme continued in 1896, when William Jennings Bryan crusaded against the corruption of the banks as represented by the gold standard. A second stream of thought growing in significance was the liberalism of John Locke, including his theory of the "social contract". This had a great influence on the revolution as it implied the inborn right of the people to overthrow their leaders should those leaders betray the agreements implicit in the sovereign-follower relationship. Historians find little trace of Jean-Jacques Rousseau's influence in America. In terms of writing state and national constitutions, the Americans used Montesquieu's analysis of the ideally "balanced" British Constitution. But first and last came a commitment to republicanism, as shown by many historians such as Bernard Bailyn and Gordon S. Wood. For a century historians have debated how important republicanism was to the Founding Fathers. The interpretation before 1960, following Progressive Era historians such as Charles Beard, Vernon L. Parrington and Arthur M. Schlesinger, Sr., downplayed rhetoric as superficial and looked for economic motivations. Louis Hartz refined the position in the 1950s, arguing John Locke was the most important source because his property-oriented liberalism supported the materialistic goals of Americans. In the 1960s and 1970s two new schools emerged that emphasized the primacy of ideas as motivating forces in history (rather than material self interest). The "Cambridge School" led by Bernard Bailyn and Gordon Wood and the "St. Louis School" led by J.G.A. Pocock emphasized slightly different approaches to republicanism. However, some scholars, especially Isaac Kramnick continue to emphasize Locke, arguing that Americans are fundamentally individualistic and not devoted to civic virtue. The relative importance of republicanism and liberalism remains a topic of debate among historians. The Founding Fathers wanted republicanism that would guarantee liberty, and most were afraid that a "democracy" (by which they meant a direct democracy) would allow a majority of voters at any time to trample rights and liberties; the most formidable of these potential majorities being that of the poor against the rich. That is, they saw democracy as mob rule that could be shaped on the spot by a demagogue. Therefore they devised a written Constitution which could only be amended by a supermajority, preserved competing sovereignties in the constituent states, gave the control of the upper house (Senate) to the states, and created an Electoral College comprising a small number of elites to select the president. They set up a House of Representative to represent the people. In practice the electoral college soon gave way to control by political parties. Not expected by the founders was the emergence of the Supreme Court under John Marshall as the final arbiter of the Constitution and indeed of all political rules. In 1776 most states required property ownership to vote, but most citizens owned farms in the 90% rural nation, so it was not a severe restriction, and was dropped state by state in the early 19th century. ... a powerful instrument in the process of making proselytes to the party.... The influence of names on the mass of mankind, was never more distinctly exhibited, than in the increase of the democratic party in the United States. The popularity of the denomination of the Republican Party, was more than a match for the popularity of [President George] Washington's character and services, and contributed to overthrow his administration. Following the demise of the Federalist Party in the late 1810s, Jefferson's party continued on as the leading political party. But internal dissension broke it apart in the 1820s. One faction became the Democratic Party led by Andrew Jackson and John C. Calhoun. The other became the Whig Party, led by John Quincy Adams, Henry Clay, and Daniel Webster. The Whigs chose a name derived from the Patriots of the 1770s who started the American Revolution and who were in opposition to the King. During the presidency of Andrew Jackson, he was portrayed as a king, giving more political punch to the name the Whigs had chosen. Both of these new parties proclaimed their devotion to republicanism. As late as 1800 the word "democracy" was in ill repute and was mostly used to attack an opponent to indicate that the candidate probably played to the mob, was a demagogue, and could not be trusted with power. Thus George Washington in 1798 complained, "that you could as soon scrub the blackamoor white, as to change the principles of a profest Democrat; and that he will leave nothing unattempted to overturn the Government of this Country." The Federalist Papers are pervaded by the idea that pure democracy is actually quite dangerous, because it allows a majority to infringe upon the rights of a minority. Thus Madison argued in Federalist #10, a special interest may take control of a small area, but it could not easily take over a large nation. Thus the larger the nation the safer is republicanism. In colonial days the Quaker elite established a monopoly on political leadership in Pennsylvania based on what they believed to be their inherent civic virtue grounded in their religious and social class. By 1760, this view had been discredited and replaced with the general consensus that civic virtue was an achieved, not an inherent, attribute and that it should be determined by the display of appropriate manliness and the valor of men who were willing to take up arms for the common defense of the colony. Pennsylvanians came to believe that all white men, not just wealthy property owners, were equally capable of achieving political voice. Martial masculinity, therefore, became the defining characteristic of the ideal citizen and marked a significant transformation in the way individuals understood their republican rights and duties. Civic virtue required men to put civic goals ahead of their personal desires, and to volunteer to fight for their country. As John Randolph of Roanoke put it, "When citizen and soldier shall be synonymous terms, then you will be safe." Scott (1984) notes that in both the American and French revolutions, distrust of foreign mercenaries led to the concept of a national, citizen army, and the definition of military service was changed from a choice of careers to a civic duty. Herrera (2001) explains that an appreciation of self-governance is essential to any understanding of the American military character before the Civil War. Military service was considered an important demonstration of patriotism and an essential component of citizenship. To soldiers, military service was a voluntary, negotiated, and temporary abeyance of self-governance by which they signaled their responsibility as citizens. In practice self-governance in military affairs came to include personal independence, enlistment negotiations, petitions to superior officials, militia constitutions, and negotiations regarding discipline. Together these impacted on all aspects of military order, discipline, and life. Historian Frank Lawrence Owsley depicted antebellum Southern society as a broad class of yeoman farmers who stood and worked between the slaves and poor whites at one end and the large planters at the opposite end of the economic spectrum, Owsley asserted that the real South was liberal, American, and Jeffersonian, not radical or reactionary. It reflected the best of republican principles (though Owsley did not use the word "republicanism.") Agrarianism in the 20th century was a response to the industrialism and modernism that had infiltrated the South. According to Owsley, the position of the South vis-à-vis the North was created not by slavery, cotton, or states' rights, but by the two regions' misunderstanding of each other. J. Mills Thornton argues that in the antebellum South the drive to preserve republican values was the most powerful force, and led Southerners to interpret Northern policies as a threat to their republican values. In reaction to the Kansas-Nebraska Act of 1854, antislavery forces in the North formed a new party. The party officially designated itself "Republican" because the name resonated with the struggle of 1776. "In view of the necessity of battling for the first principles of republican government," resolved the Michigan state convention, "and against the schemes of aristocracy the most revolting and oppressive with which the earth was ever cursed, or man debased, we will co-operate and be known as Republicans." Krause (1992) argues the "Battle for Homestead" in Pittsburgh in 1892 represented a struggle between two competing, contradictory, and irreconcilable versions of American Republicanism. One was Andrew Carnegie's belief in the inalienable right to private property and the right to accumulate capital and manage enterprise. Individual entrepreneurship was the republican way to wealth for the individual and for society as a whole. In opposition was the version personified by labour reformer Thomas 'Beeswax' Taylor, which saw in the ideology of republicanism the guarantee of the workers' right to dignity and security as a group. The strikers' republicanism viewed labor as the inalienable property of the individual worker, rejected the "law" of supply and demand and sought the group action by unions to assert the rights. They were not socialists and did not want government ownership, but they did want to control the work patterns on the factory floor regardless of the owner and his foremen. The unions were still thinking in terms of iron, when their expertise was decisive. In the age of steel the white collar engineer made the critical decisions, not blue collar workers. The union defeat in 1892 did not simply mark the end of the steelworkers' union's power, it more importantly destroyed the hopes of realizing the aims of radical republicanism. After 1900 Samuel Gompers and the AFL unions worked inside the owners' model of republicanism and sought higher wages, while the rejected republicanism vision was incorporated into the Socialism of Eugene Debs, who argued the workers should have full control by nationalizing industry and having a labor party run the government. Jane Addams stressed that women--especially middle class women with leisure and energy -- as well as rich philanthropists, had a civic duty to become involved in municipal affairs as a matter of "civic housekeeping." Addams thereby enlarged the concept of civic duty as part of republicanism to include roles for women beyond republican motherhood (which involved child rearing). A central theme of the Progressive era was fear of corruption, one of the core ideas of republicanism since the 1770s. The Progressives restructured the political system to defeat corrupt bosses (for example, by the direct election of Senators), to remove corrupt influence like saloons (through prohibition) and bringing in new, purer voters (woman suffrage).). Debate erupted in 1917 over Woodrow Wilson's proposal to draft men for the U.S. Army. Many said it violated the republican notion of freely given civic duty to force people to serve. The solution was to set it up so that each draftee voluntarily "stepped forward" to perform his civic duty. Another form of corruption was the trust--the giant business enterprise that crushed its competition. Some reformers adopted the "Iowa idea" that linked the cause of the trusts to high tariffs. Others denounced "robber barons," artfully combining crime and aristocracy. John D. Rockefeller and his Standard Oil Company were favorite targets. "Ask not what your country can do for you, ask what you can do for your country!" cried out President John F. Kennedy in a dramatic call for the American people to honor the core republican value of civic duty. In the presidential election of 2004, one of the chief topics of discussion was whether the candidates John Kerry and George W. Bush had properly fulfilled their civic duty of fighting for their country, part of the republican duties. Opponents charged that Bush had shirked his National Guard duties, or conversely that Kerry did not earn the medals he was awarded in Vietnam. A similar debate over performance of civic duty took place in the presidential election of 1884, when Republicans emphasized that Democrat Grover Cleveland had purchased a substitute to fight for him in the Civil War, while his opponent Benjamin Harrison was in combat. The term republic does not appear in the Declaration of Independence, but does appear in Article IV of the Constitution which "guarantee[s] to every State in this Union a Republican form of Government." What exactly the writers of the constitution felt this should mean is uncertain. The Supreme Court in Luther v. Borden declared that the definition of republic was a "political question" in which it would not intervene. In two later cases it did establish a basic definition. In United States v. Cruikshank the court ruled that the "equal rights of citizens" were inherent to the idea of republic. In re Duncan it ruled that the "right of the people to choose their government" is also part of the definition. It is also generally assumed that the clause prevents any state from being a monarchy — or a dictatorship. Over time the pejorative connotations of "democracy" faded. By the 1830s, democracy was seen as an unmitigated positive and the term "Democratic" was assumed by the Democratic Party and the term "Democrat" was adopted by its members. A common term for the party in the later 19th century was "The Democracy." In debates on Reconstruction, Senator Charles Sumner argued that the republican "guarantee clause" in Article IV supported the introduction by force of black suffrage in the defeated South. As the limitations on democracy were slowly removed, senators were made directly electable by the people (1913); property qualifications for state voters were eliminated (1820s); and initiative, referendum, recall, direct primary, secret ballot, and other devices of direct democracy became widely accepted at the state and local level (1910s). Thus, at present most people refer to the United States and its system of government as a democracy. ↑ Colbourn, The Lamp of Experience (1965). ↑ Bernard Bailyn, The Ideological Origins of the American Revolution (1967). ↑ Linda Kerber, Women of the Republic: Intellect and Ideology in Revolutionary America (1997). ↑ Shalhope, "Toward a Republican Synthesis," 1972, pp 49-80. ↑ Adams quoted in Paul A. Rahe, Republics Ancient and Modern: Classical Republicanism and the American Revolution. Volume: 2 (1994) P. 23. ↑ Adams 1776 quoted in Rahe, Republics Ancient and Modern 2:23. ↑ Nathan Schachner concluded, "Rousseau, whose romantic and egalitarian tenets had practically no influence on the course of Jefferson's, or indeed any American, thought." Thomas Jefferson: A Biography. (1957). p. 47. Actually, Rousseau had an influence on Noah Webster (in terms of educating children) and some of the Transcendentalists like Ralph Waldo Emerson. ↑ When Alexander Hamilton proposed at the Constitutional Convention to drastically reduce the power of the states, he won no support and dropped the idea. ↑ Webster quoted in John C. Miller, Alexander Hamilton: Portrait in Paradox (1959) p. 320. Webster, like many Federalists, called the Jeffersonian Republicans "democrats" as a term of ridicule and spite as the conservatives had no respect for the common man. ↑ George Washington to James McHenry, September 30, 1798. Retrieved on 2007-01-08. Transcript. ↑ D. Michael Shafer, The Vietnam-Era Draft in Shafer, ed. The Legacy: The Vietnam War in the American Imagination (1990), 57-79; Jeremy Michael Teigen, "The Role of Previous Military Service in American Electoral Politics" (PhD dissertation, University of Texas, Austin, 2005). Order No. DA3204197. This page was last modified 15:05, 19 September 2013.